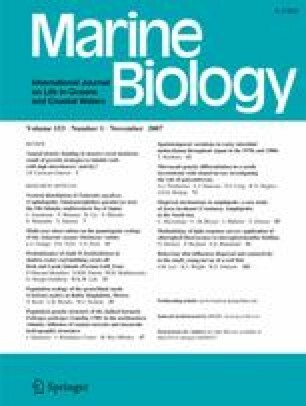 Within its distribution range in the northeastern Atlantic, the stalked barnacle Pollicipes pollicipes shows a well-defined pattern of genetic variation, comprising (a) a subtropical/temperate northern assemblage, made up of populations distributed between 47°N and 28°N along the French, Iberian, North African and Canary Islands coastlines, and (b) a single isolated and highly divergent tropical population in the Cape Verde Islands (16°N), at the southernmost limit of the species’ distribution. However, within the northern assemblage several populations show a level of genetic differentiation that allows rejection of the hypothesis of genetic homogeneity. The congruence observed between genetic and hydrographic patterns suggests a crucial role of hydrodynamics, and of the dispersal of the planktonic larvae, in the determination of population structure. Along the southern European Atlantic coast, the Iberian Poleward Current and mesoscale hydrographic structures are, respectively, facilitating gene flow at the regional level and genetic differentiation at the local level. On the Atlantic coast of North Africa, the homogenizing equatorward flow of the Canary Current does not extend as far as the Cape Verde Islands. A demographic expansion is dated to the late Pleistocene, preceding the Eemian interglacial, and is oldest in the case of the long-standing Cape Verde population, sustained by a stable tropical habitat. The divergence between the Cape Verde population and the remaining populations is thus ancient, and suggests that oceanic current patterns may constitute a generalized physical barrier to the dispersal of marine organisms between Cape Verde and the rest of Macaronesia. We are grateful to Monica Izquierdo, Dolores Pérez-Brun and Jesús A. Fernández-Barreiro for their technical assistance, and to the following for invaluable help with sampling: Eugenio Fernández Pulpeiro (University of Santiago de Compostela), Pedro López (Natura 2000), Luis Felipe López-Jurado (University of Las Palmas de Gran Canaria), Gregorio Louzara Fernández, Nieves González Henriquez (Instituto Canario de Ciencias Marinas), Jaime and Michelle Casares, Antonio Martín Cisneros, Mª Jesús Muñoz, Urbano Costas Pedrosa, Ruth Vidal and Cofradías de Carreira y Aguiño, Lira, Malpica, Caión, Ferrol and Ribadeo. The experiments performed comply with the current laws.